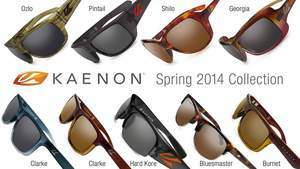 NEWPORT BEACH, CA--(Marketwired - Mar 18, 2014) - Kaenon, an independent, California-based eyewear brand, announces the release of its spring 2014 line-up. Known for its uncompromising proprietary SR-91® polarized lens material which combines the visual clarity of the finest glass with shatter resistance and high-mass impact protection in an extremely lightweight lens -- Kaenon is worn by some of the finest athletes in the world as well as outdoor and active lifestyle enthusiasts who are passionate about wearing the best. Each of Kaenon's new styles are produced in a variety of purpose-built lens tints specifically engineered for ideal performance, protection and vision on the water, grass, snow, ice or pavement. X-Kore is the next generation of Kaenon's award-winning Kore family of performance sunglasses. Sweeping curves juxtaposed with carefully-placed angles and ergonomically engineered fit geometry, results in a frame design that redefines what a sport sunglass should look and function like. The semi-rimless swept-back SR-91 polarized lenses provide maximum peripheral coverage, which equates to greater protection, performance and visual enhancement. To ensure that all these features stay securely anchored during any activity, embedded Variflex™ nose pads and temple tips grip at all contact points and provide all-day comfort. X-Kore will fit a broad range of users who prefer maximum coverage from the elements. Ozlo was created to provide excellent coverage and all-day comfort, making it the perfect choice for those seeking a lightweight frame to support a broad spectrum of outdoor and lifestyle use. Featuring clean and simple lines with subtle architectural detailing, Ozlo includes embedded Variflex nose pads for comfort and slip resistance. Made in Italy, Ozlo is finished with unique hand-painted all-matte textures in walnut or seaweed patterns, as well as an all matte black. Pintail draws its inspiration from successful, existing Kaenon sunglasses, Arlo™ and Trade™. Featuring slightly larger lens orbitals set on the same geometry as Arlo, Pintail offers a larger profile for the wearer who prefers more coverage. Its all-day comfort is enhanced by features that spread tension loading while offering a secure fit. Pintail's street appeal is further characterized by subtle sculpted details and pintail shaped temple tips. Shilo is geared towards the woman with an active lifestyle who desires both fashion and function. Available in classic black and a hand-painted tortoise shell pattern, Shilo's lightweight Italian-made frame curves from the slightly oversized front into slender flexible temples which result in an equally comfortably and stylish feminine frame design. Shilo is as practical as she is graceful. At first glance, Kat-i is softly reminiscent of traditional pin-up girl fashion, full of classic beauty and overtly feminine styling. Look a little closer and you'll see the subtle cat-eye detailing found in its upper corners. This retro-styled product has performance built in and features smooth-sloping mid-sized arms, SR-91 polarized lenses, and availability in a variety of hand-painted colors. Maya enjoys a classic, gentle frame design that draws just enough attention to itself without overwhelming. The frame is noteworthy for its clean and subtle surfaces that feature an upswept, curvy brow for a comfortable and secure fit. Made in Italy, Maya features unique hand-painted color palettes to allow the wearer to show off individual style with fun and sophistication. Maya's moderate sizing allows for a variety of female face shapes and sizes to be accommodated for. Georgia™ is now available in an ombre fade named "Mai Tai;" Clarke™ is now available in both a unique matte blue fade finish called "Denim Wash," and a two-tone matte and gloss finish named "Whiskey," which features a silky-smooth matte brown top and glossy golden-brown bottom. The high-performance and very successful Hard-Kore™ line continues to see athlete-inspired color-ways with the addition of "Graphite," a matte frame finish accented with a splash of Kaenon corporate orange. Each of these new additions to the Kaenon product line-up is also available in prescription optical in single vision prescription for those requiring vision correction up close or at a distance, and in freestyle progressive prescription for those who require correction up close, far away, and everywhere in between. To browse Kaenon's complete product portfolio, visit www.kaenon.com. ABOUT KAENON: Founded in Newport Beach in 2001 by brothers Steve and Darren Rosenberg, Kaenon is an independent, California-based eyewear brand that designs, produces and distributes high-performance sunglasses, prescription sunglasses, and ophthalmic products. Filling a void in the marketplace for a superior polarized lens combined with performance frames, Kaenon revolutionized the industry when it set the bar with its uncompromising proprietary SR-91® lens material, which combines the visual clarity of glass with shatter resistance and high-mass impact protection, along with purpose-built lens tints and light transmission levels, all in an extremely lightweight lens. Designed in California and hand-painted in Italy, Kaenon frames feature distinctive details that further distinguish it from the competition. Awarded "Gear of the Year" by Outside Magazine, Kaenon is worn by men and women, professional athletes, Olympians, and sports and active lifestyle enthusiasts searching for premium quality, attention to detail and unmatched protection, performance and vision, all finished with unique styling. Built on the motto, "never compromise" -- innovation in design, engineering and technology continue to be at the core of the brand. Kaenon is sold online and at specialty retailers throughout North America and select locations around the world. For more information about Kaenon, please visit www.kaenon.com.